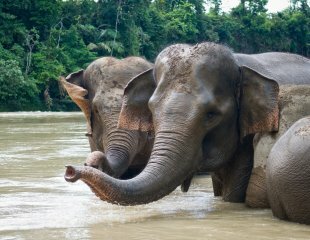 A Rainforest Action Network field investigation team has documented new evidence of large-scale, illegal rainforest destruction within habitat critical to the survival of the Sumatran elephant, tiger and orangutan. RAN’s research has uncovered supply chain connections that link the rogue palm oil company responsible for the deforestation to major global brands through their shared supplier, Wilmar. The companies implicated include PepsiCo, McDonalds, Nestle, Unilever and Procter and Gamble. This forest clearance is taking place in direct breach of the Indonesian government moratorium on the clearance of rainforests for palm oil plantations announced last April, as well as the no-deforestation policies announced by palm oil giant Wilmar and other brands that commit the companies to eliminate conflict palm oil such as this from their products. You can QUIT your participation in this problem by changing what you eat and what you buy.